Has the Sudarium been radiocarbon dated? Yes, this is mentioned in the article. It must also be pointed out that the main stains on the Sudarium were placed on the Shroud face in relief. I wonder if the sudarium has ever been tested for pollen, as Max Frei tested the shroud? If one excepts Frei’s pollen claims, that creates a problem for the carbon dating. We know the shroud’s location since 1355 and it never was in the Holy Land. Hi Matt, yes the Sudarium has been tested for pollen and the findings apparently coincide exactly with where the Sudarium had purportedly travelled along the Northern edges of Africa from Israel into Spain. As far as I remember the Sudarium of Oviedo was radiocarbon dated once more in a spanish laborator (/ I guess in Madrid) in 2008. The results confirmed a previous dating from the seventh century A.D.although this was not a surprise at all for scientists of Centro Español de Sindonologia because it is well known that the Sudarium has a high level of contamination. When I attended 2012 Valencia Shroud Congress I remember to listen to a presentation by a member of Centro Español de Sindonologia who explained those results because there was enrichment of the fabric with new C14 from tiny carbonaceous particles stuck to the fibers which could not be removed in cleaning pre dating procedures. Actually he showed interesting images where everyone could see those tiny black spots stuck to the fibers, as he explained resulting from previous fire in the cathedral. I got the idea that a correct radiodating of Oviedo Sudarium was thus impossible. This is all I can share with you. Has someone a contact to Senor Ortega? Perhaps he may agree for his paper being published on Barrie’s site. Agradeço sua mensagem e encorajamento. Também vejo que você faz a sua parte do trabalho. Sobre a datação da relíquia, sei que a Camara Santa explodiu em 1934, causando danos, e também cheguei a pensar que esse acontecimento poderia ser uma das causas dos resultados em 1983. Thank you for your message and encouragement. I also see that you do your part of the job. Regarding the dating of the relic, I know that the Camara Santa exploded in 1934, and also thought that this happening may have been one of the causes of the 1983 results. Antero, bom dia, peço desculpas, pensava que morava em Lisboa. Good morning, Antero, sorry, I thought you lived in Lisbon. Louis: Thank you for your interesting paper. I know, oneday some one will prove that both the Shroud of Turin and the Sudarium of Oviedo wrapped the same person in first centuary. Much will depend on further research, and if hands-on examination will be permitted in the future. In the case of the Sudarium, we do have details about the radiocarbon dating, so it is not to be taken very seriously and, as you know, the 1988 dating of the Shroud is controversial, there are just too many doubts for one to be sure about the results. The Shroud is not an article of faith in the Catholic Church, but many Catholics and Orthodox Christians venerate relics, not Protestants. Yet, the Shroud is an ecumenical topic and can help bring Christians together. Sorry, I meant “we do not have details” about the radiocarbon dating of the Sudarium. 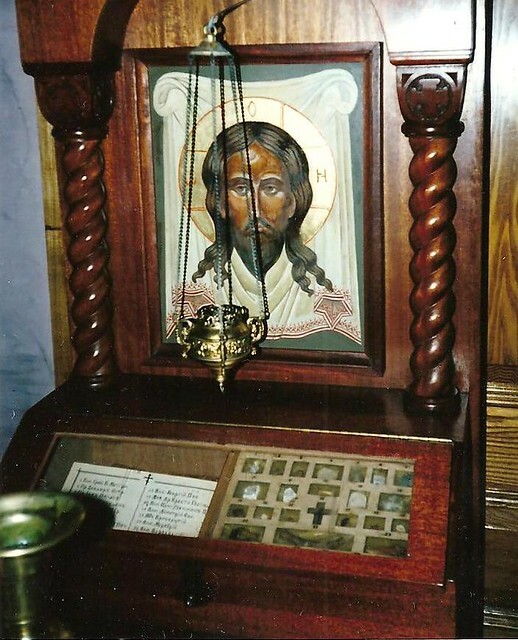 The icon and other materials are Orthodox Church relics.